Initial reaction, awesome! Not so if you are a prospective buyer trying to purchase Real Estate in Hamilton. Hamilton’s market is booming due to affordability. We’re just trying to catch up. We are seeing a huge influx of buyers from the GTA. Then of course there is our diversification, growing grassroots arts and music community, loads of green space, trails and waterfalls, improved commuting options and just the fact that we are getting on the map. The best kept secret is no more, the word is out. A strong commitment by city and developers to urban revitalization. 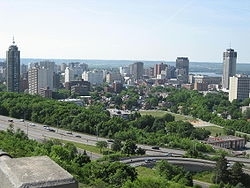 Hamilton is a fabulous place to live, work, learn and play and a great place to raise a family. A great place to invest with no sign of slowing down. Here are some links to great Hamilton resources. For information on how to Buyers can handle this strong Sellers market in Hamilton, watch for my next blog or contact me by phone or email. kathydellanebbia@royallepage.ca or 905-537-6005.